The image on the cover of The Asian Executive magazine is the result of perhaps the hardest and fastest ten minutes I may have ever spent shooting. It is an interesting situation into which we photographers are often thrust. You are told you have an hour to shoot the cover and you accept, wishing you had some time to get into the zone, get the photo mojo working and really work that thing. However, what happens more often than not is that when the reality actually hits, you have much, much less. This was one of those cases. The rooftop of the parking lot where we were told to meet was not the most exotic of locations. Neither did it afford us quite the view we were all hoping for. The concept of the image did not in any way meet the realities that were possible. Add to that the reduced time you finally have to create the shot and you can be glad you have been doing this for a very long time. What does it come down to? For the photographer, it is a matter of getting the image firmly implanted in your mind and working quickly but thinking slowly until it is in the camera. That is easier said than done and it is not the best way to work. Tash and I work as a well-oiled team, and when it comes down to it we just get into the process, each knowing what to contribute, what to do and what to suggest, leave in or leave out. Me? I was on the ground with the Nikon D800 and the Nikkor VR70-200 using the lens at full telephoto to compress the subject with the background. Tash was out of frame with a stand mounted Nikon SB24 connected to a Pocket Wizard. The 36MP resolution of the D800 certainly impresses a client, and the off camera flash gave us a fighting chance with some interesting light on an otherwise dull and lifeless day. In the end, the client was impressed - not only with the images we produced but also the calm, humorous and engaging way we dealt with his client. So, that being the case, we have just now finished the shoot for the next cover of this magazine and will blog about it soon. David Harris, Patrice Lipoki and Rob (Millsy) Mills will be performing at Melbourne Zoo next week! Hello Blog! Its been a while. Nice to be back! 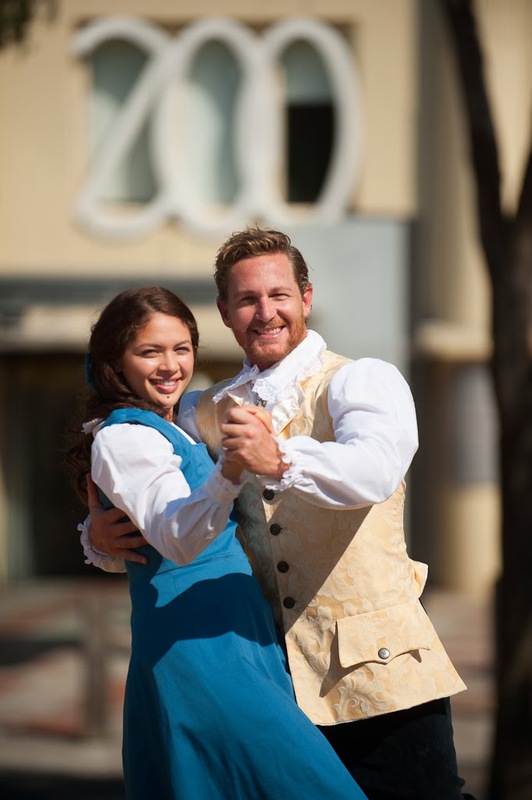 Last week, Living in Pictures (that's Tash and me) were commissioned to capture some publicity photographs ofthe upcoming production of Beauty and the Beast, a performance which will be taking place at Melbourne Zoo on the 26th and 27th of January. Yes..that's this Sunday and Monday. So together, Katherine McPherson, Adam Lowe and our three stars - David Harris, Patrice Lipoki and Rob Mills braved the 40+C heat to create some images for publicity. Working with professional people like this is always gratifying. They let nothing get in the way and they continue despite the conditions. The heat was intense, and it had been for days. Imagine then, how wonderful their performances will be!To book for this performance of Beauty and the Beast, click here. Its going to be a great show, and the price of the tickets is extremely reasonable. We will see you there! 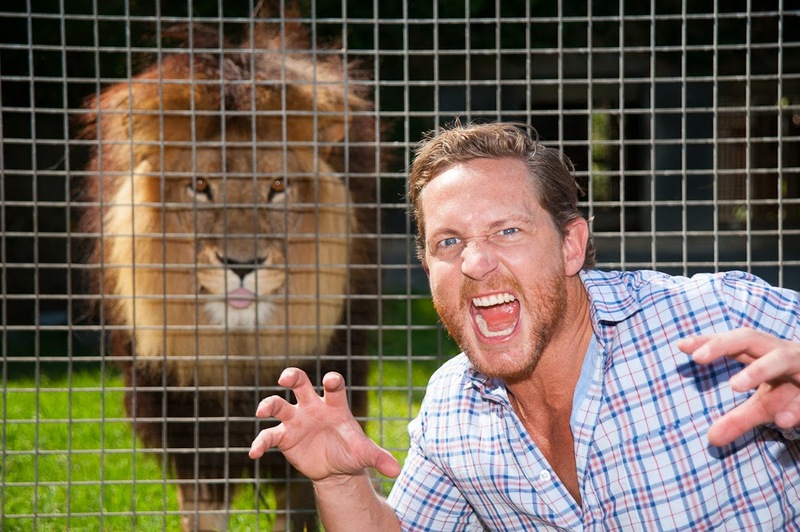 David Harris being Beastly with the King of Beasts!